Pilates Mat Exercise: Tips to get more out of your Workout! Pilates mat exercise can be done anywhere, with or without instruction. This can be an asset or a detriment to the work if you are not being properly coached on correct movement patterns. Because Pilates mat exercise involves a good deal of body control, focus, and precise movements, doing the exercises without proper supervision can hamper your efforts toward improving. My goal is to assist you in proper form by cueing your body into a precise and graceful looking piece of art. With the proper muscle development and control you will find that you will more efficiently and gracefully flow from one precise Pilates mat exercise into the next. Let’s take a look at some of the most common Pilates mat exercises and how you can get the most benefit out of doing them. head and trunk are very still and unmoving as you pulse the arms long at your side in time to the breathing. Head and shoulders are lifted feeling the abdominals flatten and the fold under the chest to release any tension in the neck. To get more out of this exercise extend the legs at a 45 degree angle, squeeze your heels together connecting the inner thighs and lifting the buttocks so the tailbone feels like it’s being pulled down. See pictures and more detailed descriptions of the hundreds here. Lying flat on your back with one leg anchored to the mat and the other leg extended up in the air. Keep your torso, especially the pelvis (buttocks) anchored to the mat as you circle the extended leg in the hip socket. To get more out of this Pilates exercise make the circles larger and quicker without rocking the body. Exhale as you pull the leg back to the center then begin the next circle. They are not continuous. Make each circle very definite! Repeat for up to 8 repetitions on each leg. Start by sitting up in a tucked position with your hands across your shins and balanced on your sitz bones. Roll back to your shoulder blades as shown and then come back up to a balance without letting your feet touch. To get more out of this exercise and to keep the chest from rounding imagine reaching for the mat with your waistline feeling your hips float up over you. Don’t whip the legs but focus on the distance between your nose and knees staying the same throughout. Lying on your side with hips and shoulders stacked over each other. How to do Pilates side kicks: Up/Down, Front/Back kicks and small circles. To get more out of your side kicks keep the top leg reaching at or past the bottom leg, which will keep your waist long and lifted off the mat. The top hand can be placed behind the head to make the side kicks more challenging, and for less support and more core control as you kick your legs up and down, forward and back. 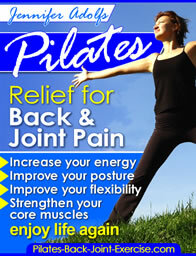 Find my favorite recommended Pilates Mat Exercise DVD here!